Boston Red Sox postseason hero Nathan Eovaldi has reportedly agreed to re-join the Sox on a four-year, $67.5 million deal. 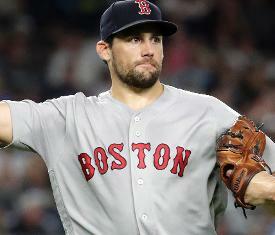 Eovaldi, 28, tossed 22 1/3 innings to a 1.61 ERA while helping the Red Sox capture the 2018 World Series, after he spent the first half of the season with Tampa Bay. The former Yankee is known for a devastating fastball and an emerging cutter, which he picked up during his time with the Yankees from 2015-2016. The young righty has had his share of injuries, however, with a pair of Tommy John surgeries as well as a right flexor procedure done back in August of 2016. Some have speculated that Eovaldi will take on a more permanent long-relief role rather than join the Red Sox rotation, however there's still time before Boston has to sort out those decisions while the offseason spending spree continues. Eovaldi was another potential free agent target for the Yankees to consider, but the team has already seen Eovaldi up close in his two years with the team, even after his impressive playoff run. Patrick Corbin and Eovaldi represent two big arms now off the market, which could accelerate the market for the remaining starters and impact arms available in free agency.